The additional island amenities are scheduled to be complete by summer 2010 just in time for special five-night cruises aboard the Disney Wonder with two stops at Castaway Cay, and the Disney Dream cruise ship which starts sailing in early 2011. 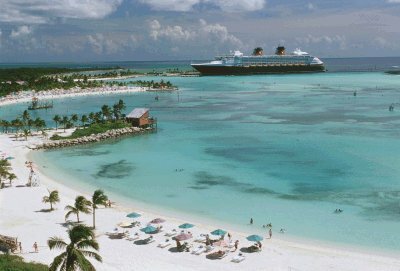 Walt Disney Imagineers originally designed Castaway Cay with one-of-a-kind areas and activities for every member of the family, while celebrating the natural beauty of the 1,000-acre island. Among the crystal-clear turquoise waters, powdery white sand beaches, swaying palm trees and lush landscapes, guests soon will find the following transformations. New Cookies Too family lunch buffet location serving all-you-care-to-eat barbeque, island spiced rotisserie chicken, burgers, grilled fish, fresh salads, flatbreads, ice cream, complimentary soda and more, in a covered pavilion just steps away from the expanded family beach. New Flippers & Floats beach rentals providing inner tubes, snorkels, masks and fins. New Buy the Sea Shore merchandise location selling a variety of Castaway Cay-exclusive items along with towels, sunscreen and other beach essentials – a complement to the island’s other merchandise location, She Sells Sea Shells & everything else. Guests can slide and splash at a new water feature called Pelican Plunge. The 2,400-square-foot floating platform, located within swimming distance from shore, celebrates the island’s native pelicans. Various flotsam and jetsam – such as nautical rope, cargo nets, buoys, signaling flags and starfish-like ornamentation – adorn the platform. Two exciting water slides – an enclosed corkscrew slide and a 140-foot-long open slide – take guests on a twisting ride, ending with a splash into the lagoon. A giant “bucket dump” delivers hundreds of gallons of water, soaking eagerly awaiting guests. Four water cannons provide sharp-shooting fun with floating nautical targets approximately 20 feet away. On the island, a brand-new, 2,400-square-foot water play area called Spring-a-Leak helps guests cool off while immersing them in what appears to be the remnants of a washed-away beach dwelling leaning in the direction of the prevailing winds. The watery fun begins as guests enter the storm-ravaged structure, greeted by dripping pipes, broken plumbing and hissing misters, exposed and twisted by the tropical tempest that wiped out the original structure. A “splash pad” is the focal point and gives the impression of water pooled on the ground. Water jets squirt, spray and saturate guests. Shade is provided by leftover pieces of the corrugated steel roof, aged and distressed fabric and the occasional palm tree growing up through the floor foundation. Parents can relax and have a seat – or, better yet, join in the fun – as kids frolic in the wet and whimsical setting. The “hub” of youth activities on the island, Scuttle’s Cove, will feature a new water play area for the youngest Disney Cruise Line guests to splash and enjoy as part of supervised youth activities on Castaway Cay. A 1,200-square-foot soft wet deck area provides fresh-water fun with an array of pop jets, geysers and bubblers. Overhead, shade sails circle the area like a compass and marine props – a captain’s wheel, boat oars, life preservers and nautical rope – complete the castaway theme. Guests can have a little piece of paradise all to themselves at one of 20 new private cabanas. The premium rental cabanas provide the privacy and luxury of a deluxe beach retreat with an option to add the personalized service of a cabana host. The majority of the exclusive 325-square-foot beach cabanas will dot the far side of Castaway Family Beach, giving guests more privacy along with a spectacular view of their Disney cruise ship from the cabana’s large front patio deck. A handful of private cabanas will be located on Serenity Bay Beach, exclusively for adults, providing the ultimate in upscale seclusion. Each well-appointed cabana is furnished with comfortable cushioned chairs, luxurious chaise lounge chairs, stylish side tables and a dining table. Other convenient features include a refrigerator, lockable storage unit, outside fresh water shower and sail cloth for shade on the deck. Amenities included with a beach cabana rental include non-alcoholic beverages, suntan lotion and fluffy towels. A variety of a la carte services and packages will be offered, including special food and beverage options. The popular Castaway Ray’s Stingray Adventure will be moved to a different location in the lagoon, adjacent to the existing Gil’s Fins & Boats beach rental. Once complete, guests will be able to swim and interact with stingrays in an even larger area within the private lagoon. Teens will enjoy Hide Out, an all-new secluded area on the island just for them. Off the beaten path, but near everything, this teen retreat is a great place to hang out and soak up the sun, just steps away from the beach, activities, food, ice cream and refreshments. Multi-colored deck chairs and sail cloth shades create the ideal getaway to gather, kick back, listen to music and watch the action at the nearby beach volleyball and soccer areas. In Da Shade Game Pavilion provides guests wanting to take a break out of the sun a place to play games such as table tennis, foosball, billiards and basketball. The new shaded structure is centrally located, near Castaway Family Beach. To provide additional adult pampering, three new massage cabanas will be added to the adults-only Serenity Bay Beach. For unparalleled relaxation, adults will be able to enjoy a therapeutic massage, or couples massage, at one of eight private cabanas overlooking the ocean. Guest transportation is provided to and from various points on the island via tram. For greater convenience, additional tram paths will be created and a new Pelican Point Tram Stop will be located farther down Castaway Family Beach, near most of the new additions to the island. The cruise ship dock at Castaway Cay eliminates the need to tender, making the ship easily accessible throughout the day. To accommodate Disney Cruise Line’s new ships, additional mooring dolphins will be installed to lengthen the dock. The video below provides further details of the enhancements. Disney Cruise Line sails to Castaway Cay on all itineraries originating from Port Canaveral, Fla. Disney Cruise Line offers three-, four- and seven-night itineraries to the Bahamas and the Caribbean with special voyages to the Mediterranean and Northern Europe in 2010. Land/sea vacation packages that include a stay at Walt Disney World Resort provide the ultimate Disney vacation experience.